These beautiful orange glass hanging star lights can be used to bring a rich and warm glow to any room. Talented Mexican craftsmen have adopted the Moravian traditions and are now well known for their own handmade star lamps. 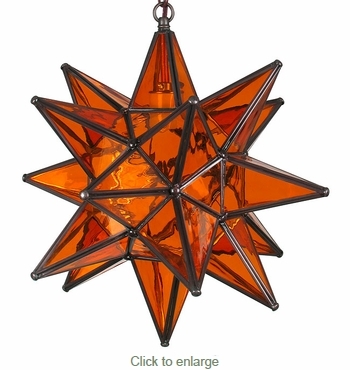 This orange glass star light will bring a whimsical look to your home. $13.65 Small Natural Tin Ceiling Plate 5" Dia.